Angela’s dog Chloe, “poocher smoochers.” Photo Submitted by Angela Gutzer. This quote brought much solace to me as I entered the world of grief. It helped me elevate myself above the restriction and pain the human condition contains, and free myself from the constricted chains of ego isolation in the chaos of grief to the inner truth of spirit. I had grown accustomed to physical truth. Go to school, get a degree, get a job, build a home, pay debts, and remain in the physical. Of course, there was a little spirit guide within me screaming its head off trying to grab my attention. “Push it down,” was my mantra. Through little crevices the voice arose to be heard, then squashed back through the tight spaces from which it came. This small voice within continually grew as life’s twists and turns continued relentlessly until my shell of self was cracked open and the voice became a flood within me. My dear love Chloe taught me to listen. My mantra changed. 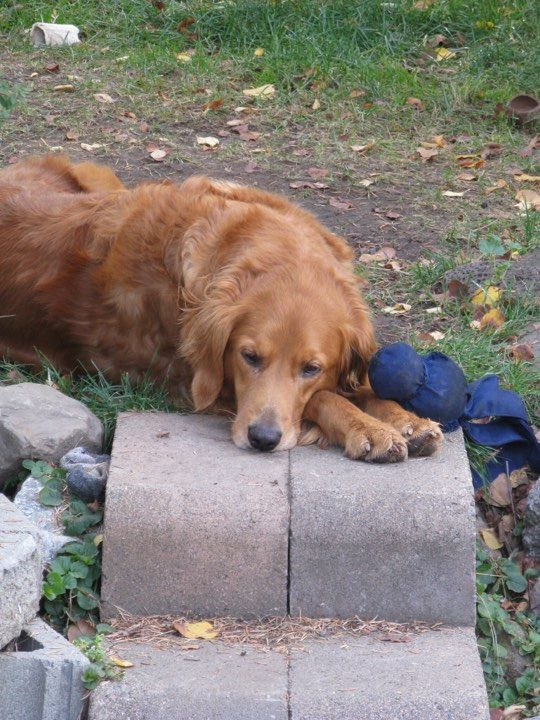 Chloe was a beautiful golden retriever—my first furry love outside of the family home. She was hopelessly gentle, loving, and forgiving. A true angel indeed. She simultaneously opened and broke my heart with her passing. The question of “Why?” arose. This question of “Why?“ led me incrementally towards my new passion. Death. Death. The word people fear. The ending of life, or so I thought. What if death is a beginning or a continuation? What if death only symbolizes a change in our physical realm and not spirit? By Chloe’s passing I delved into death. My sister emphasized the blessings that came through death. I could not see them. “Why?” reared its ugly head so repetitively that I couldn’t see the truth. “Why?” slowly became “Because it is so”. “Why?” became “Look deeper; keep searching”. As a veterinarian I was honoured to be close to death. People would compassionately say, “this must be so hard for you”. It was difficult, I agree. But the difficulty was not in the death of the beloved furry family member itself—it was in the emotional realm. The place people go with death. The inability to see death as a necessary part of life. The view of death as a negative process. I would cry as human members of the pets’ families cried, and I would take those emotions with me as I drove home. I would hug my critters even tighter, and walk them even longer to escape my grief for those departed souls. But yet, I knew they were in a good place. I felt as if their souls were light and free from disease. They were happy, yet I was sad seeing their families so distraught. Another “Why?” Why would we be so heartbroken at the lack of physical presence while they are there free spirited and having fun? Why would our hearts be broken when perhaps we should be celebrating their lives and how free they are? Many people have told me miraculous stories of the afterlives of their beloved furry family members. A dream in which they appeared, or a bark to protect loved ones in the physical plane of reality. All of these stories, the animals, and my journey has led me to learn more. I am now enrolled in the Contemplative End of Life course offered through Institute of Traditional Medicine. A term to describe the the art of serving the dead and dying is “thanadoula” (thanatos=greek word for death, doula=servant). Hence the title “death doula” for a person utilizing these skills. The course runs over a six-month period and takes place in Calgary. The course material is diverse ranging from palliative music therapy, cultural views on death, palliative massage, meditation and self care, biological symptoms of death, rituals and ceremonies for the end of life, creating care plans for the end of life, childhood loss, and grief counselling. I will be finished the course in October but will not receive my certification until next year as the wildfires prevented my presence for one of the weekends. At the time of enrolment in this course my mother was facing death as she was diagnosed with cancer. It was quite a meaningful decision. After a year of chemotherapy and prayer she passed through the thin veil into spirit March 18, 2017. All I can hear is beautiful music from the other side. All I can feel is love. She is closer to me than she was in the physical. I have been able to delve into my grief through the course. In the first weekend we created a shrine and placed objects connecting us to our beloveds. I brought a divine goddess shaped rose quartz. 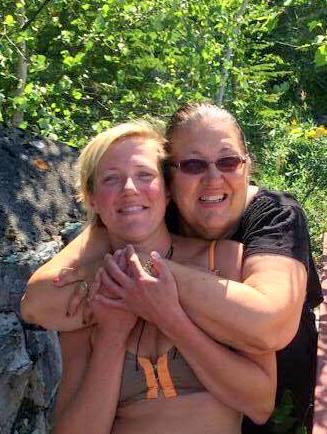 I placed the quartz over my mother’s heart in her final hours of life. I placed it there to allow full love to flow through as she slowly entered spirit. What a gift to be in the presence of fellow participants sharing in their grief as you allow them to see yours. I hope to share more of my experiences and knowledge of the course in upcoming articles. Remember people: Dying is beautiful! Angela is a veterinarian currently working as a locum. Creating her own schedule has allowed her the space and time to invest in the contemplative end of life (death doula) course in which she is currently enrolled.